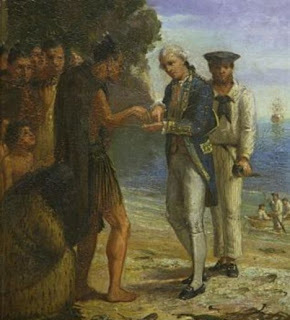 there is a famous, if probably apocryphal story about Captain Cook's first landing on one of the Polynesian Islands he visited during one of his voyages of discovery: the story goes that, so far beyond the native islanders experience was the eighteenth-century European world he came from that they were literally unable to see the boat he had come in. when communication had been established and they asked him where he had come from, and how he had got there, and in reply he pointed to the great three-masted sailing vessel anchored off-shore, they stared in an incomprehension that, quite literally, occluded their vision. the ship conformed to no known configuration of their experience of the world, so it was invisible to them. it's clear that, in many aspects of our development, we require guidance towards understanding what it is we perceive: that perception precedes cognition, and that the link between the two is the learning experience. we appear to inhabit an oscillating universe in which our sensory apparatus has evolved to compensate for the ever-moving waves and particles of the material world by adopting a set of oscillating platforms of its own. we are constantly comparing one experience with another at the micro level in order to make sense of what it is we are perceiving. the eye, for instance, is never still - it is constantly vibrating, making tiny movements up and down and from side to side in order that the photosensitive cells on the retina can compare one stream of photons with another and combine these comparisons into a visual representation of what is out there (at least, in the wavelengths that were determined to matter on the natural selection route). all the way up to the macro level, each item of information we acquire about the world is compared with those which preceded it in an ever-expanding library of sensations and memories. and eventually, when we have acquired a sufficiency of experiences and memories, we are able to apply a sophisticated discriminatory function that compares our personal libraries with all those others out there in everyone else's head, and start developing a thing which we call 'taste' - whether we apply it to what we eat, drink, hear, or see, we still call it 'taste' - something which, in turn, helps others to decide whether or not we and they have enough in common to feel comfortable in each others company. this taste thing - as applied to music - is far more sophisticated, obviously, than preferring, say, sweet foods to savoury, or the other way round. what would the musical equivalent to that be? preferring assonance to dissonance? hard to say, because our relationship with music has less to do with our capacity to hear and discriminate between different tones and rhythms than with the sort of mentoring - direct or indirect - we have received in the course of learning how to hear this cultural construct we call 'music'. it is often repeated that music is a language, one that is capable of facilitating a form of communication between people whose native spoken language is different, and one that is able to articulate aspects of our experience that words fail at. if both of these statements are true, then it follows that the process of learning about music - that bridge between perception and cognition - is more analogous to learning about gastronomy than about the fundamentals of another spoken language. everyone eats, just as everyone makes noises, but we require guidance towards the enjoyment of a wide range of gastronomic pleasures, just as we require guidance towards hearing the wider range of possibilities of acoustic pleasure. 'understanding' is never the point, any more than understanding a soufflé is the point. the literature of musicology is constipated with the language of understanding, a language that is often as patronising as it is hermetic. the better commentaries on such non-cognitive experiences as enjoying good music or food tend to be those which abandon the descriptive in favour of the anecdotal – a tacit acknowledgement of the fact that the translation of one sensory language into another is a fundamental oxymoron. for all that, there remains the very interesting question of whether or not music carries any meaning at all beyond the immediately emotional and visceral. and that, in turn, raises the question of the relationship between the artist and his or her audience - how, in the process of its creation, the artwork becomes separate from the artist. the literature of artistic meditation is full of references to the phenomenon of the creation - be it a novel, a piece of sculpture, or a piece of music - taking on a life of its own, of the relationship between artist and artwork being similar to that between parent and child, and of its seeming - literally, in many cases - to determine the course of its own completion. art – particularly Modernist art – has come to be considered almost as an extension of the unconscious, or the libido, or both. but art doesn't exist in a moral vacuum, and, as a spectator or listener, acquired knowledge about the biographical events surrounding the work is clearly as important as the work itself. 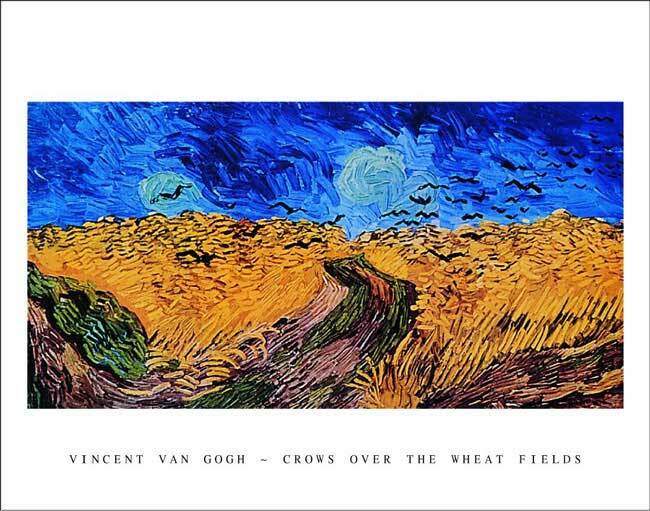 if, on the other hand, we regard it in the knowledge that it was the last painting van Gogh ever worked on, and that he died soon after completing it, it takes on an entirely different set of readings, particularly when we add to that knowledge the commonly understood biographical details about his madness and poverty. similarly, once we have learnt that Carl Orff was one of Hitler’s favourite composers, it becomes impossible wholly to enjoy his gloriously Rabelaisian Carmina Burana without experiencing a pang, at least, of pc concern. the same applies to all music which has in some way been contextualised by commentary - and almost all music has, whether in the form of critical assessment or anecdotal annotation. there have been many more or less erudite attempts to explain the finer points of musical language by analysing particular keys or scales or chord-progressions as utilised by particular composers to achieve particular effects. in the course of the 2006 Reith lectures, for instance, Daniel Barenboim himself demonstrates several such. I suspect, however, that such repeated attempts to analyse how such and such a chord in such and such a key might evoke such and such a response is more akin to a form of didactic sleight of hand than Mosaic dogma. if there is sufficient authority behind a particular statement about the world, that statement can quickly become an axiom. the majority of artistic judgements occur in this way. at the very least, it's a form of tautology. let's say that we hear, for the first time, a certain musical passage which we find affecting, and which we come to understand is expressive of loss, say, or yearning, then an authority such as Barenboim comes along and painstakingly analyses - usually demonstrating on a piano - the musical structures underlying this effect, and, hey presto, our ears are opened and our understanding is complete. our own inarticulable sense of something special having happened when we heard the music has been articulated, redefined in reassuringly comprehensible English, and, henceforth, whenever we hear that kind of progression, or structure, we know what it 'means' because we have been armed with the means (the words) to describe it. this is probably no more than to say that this is how it – culture – works: that, over time, an aggregation of opinion occurs as to what means what, what matters and what doesn’t, what is good and what is bad, guided by a dependable grouping of authorities whose combined opinions coalesce into a set of doctrines which, in turn, become grist to the continually developing cultural mill. it becomes impossible, therefore, eventually, to challenge such received opinions as that Mozart’s Symphonies or Rembrandt’s portraits embody the human spirit par excellence because such opinions have become the aesthetic equivalent of Newton’s First Law of Thermodynamics – their ‘humanity’ exhaustively analysed as a function of key-changes or brush-strokes. whether or not music has the capacity to do anything more nuanced than embody the human spirit in this very generalised sense is hardly worth arguing about: clearly it can't describe, for instance, the processes at work in a Shakespearean sonnet or any similar work of literary genius - that isn't the point of music, despite what an army of wishfully thinking pop critics might have us believe. the music can support, and seem to reinforce the sentiment of the average lyrics - either I love you and you love me and we're as happy as we can be in a major key or I loved you but you left me for another so I'm a bit sad in a minor - but, in reality, bereft of the lyrics, we're for the most part left floundering in a swamp of interchangeable genre-dependent sounds that manifest the entire range of the emotional alphabet between A and B (and occasionally stumble on to C). that we can, and do, nevertheless, find some music either as breathtaking as staggering onto a Himalayan summit, as joyful as the birth of our first child, or as gut-wrenching as losing our most precious possession is a side-effect of our two-steps-forward one-step-back progress towards our evolved humanity, when the cerebral cortex finally wrapped itself around the limbic system. because we can speak, we think we can speak about anything, but, at its best, music occupies the breathing spaces between the words, than which it is no less affecting, and at its very, very best, it articulates that which remains and will always remain resolutely unsayable, but as necessary to the articulation of our humanity as our ability to love. no-one owns a watch with a digital readout anymore, do they? there are a few places where the 14:50 format is deemed appropriate - railway stations and computer menu bars, for example, as well as those obviously science- or sports-related situations where microsecond precision matters - but, by and large, we have resisted the displacement of the earlier technology, and our wrist-watches - from the most basic and utilitarian to the ones that are supposed to reveal our personality (ie as a dipstick platinum-plated saddo with more money than brain cells) - are still a 3 - 4cm disk with a big hand and a little hand and twelve evenly-spaced divisions around the circumference. this isn't a manifestation of some sort of universal technophobia lurking beneath the floating-windows-based phase 3 technoworld - more a reminder that, at the deepest layers of our consciousness, we are aware of time as something more than a set of incremental numbers. digits describe only the points, the units of which, by universal consensus, time supposedly consists. it's clear, though, that our individual experiences of time encompass far more than the passing of units, that our acquaintance with time encompasses its relationship with space also, and that this indivisibility is better represented by the traditional form of the clock face than by the digital readout. if I am due to meet someone at two o'clock, and glance at my wrist to see the big hand on the 10 and the little hand next to the two, I am comparing that wedge of space between the ten and the 12 with my own relationship with promptness. I know that that wedge is decreasing in a very measured and gradual way, as if it were a door closing, and that its positive characteristics ('early') will become negative ones ('late') once that wedge has decreased to a slice, then a sliver, then passes through the zero point of transition before starting to increase again, incrementally, in its negative form. for most of us, it's much easier, more immediate, to visualise time passing in this way than to hear or see it as a countdown. interestingly, prerequisite to the maths underpinning the more arcane cosmological theories about the Big Bang is the fundamental understanding that that original event was responsible for starting the clock running - that not only matter, but time as well originates from that point. perhaps, at some core level of consciousness, we're aware of that. 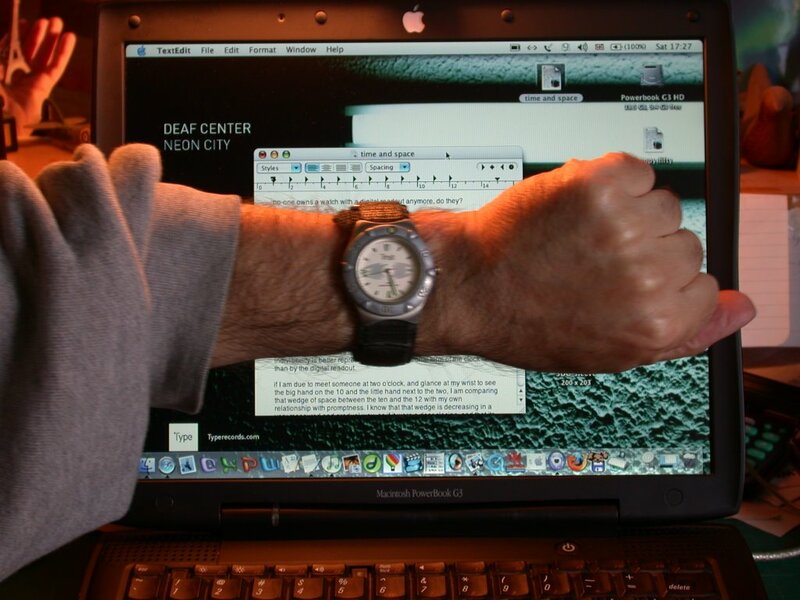 depending on their routine, everyone has their own way of visualising time beyond their wrist-watch. whether annual, seasonal, calendrical, or diurnal, our progress through time is something most of us see as some form of journey - a path that began at our birth and whose vanishing point, somewhere beyond the horizon, will coincide with our death. we're simultaneously aware that there were events before we were born - history - and that there will be a continuation of events after our death - the future - despite our continuing inability to experience it. our cyclic experiences of time - the days, weeks, months and years - are now more detached than formerly from their associated natural markers - the seasons - and few of us are even aware of the larger cyclic occurrences - the macro-temporal events such as the lunar or the other planetary cycles, and least of all of such enormously slow cycles as the circulation of our galaxy. that entropy rules and that, in the wake of the rule, everything gradually gets slower, is something so enormous as to be inconsiderable, but it nevertheless has a human-scale analogue that has wide-ranging implications. the journey from cradle to grave is one of slow but sure deceleration. the human heart, for example, has already begun its work at around the 5th week of gestation, and is beating, at birth, at around 220 pulses per minute. this rate diminishes rapidly in the first few months, the months of maximum growth rate, when the blood supply is correspondingly maximised, and by the end of its first year, the infant's heart is pumping at around 150 beats per minute. this rate continues to diminish by one beat per year until, at 25, it will normally be pumping in a range (between at-rest and maximum activity) of around 117 - 176 beats per minute, and at 75, between 87 and 131.
the infant's and the old person's conception of time itself is equally different. the twenty-four hours of a day represent about a twentieth of a five-year-old's life, but only about a three-hundredth of a seventy-five-year-old's. by the same slightly dubious logic that we use to maintain those strange comparisons of animals' lifespans with our own (you know the kind of thing - a three-year-old dog is a teenager because dogs only live to ten or so) we could say this means that a five-year-old's day is - or is perceived to be - fifteen times longer than a seventy-five-year-old's, and that if days were regularly-spaced telegraph poles beside a railway track, they would appear to be passing at walking pace to the child, whereas to the old person in the seat next to him or her they would seem to be flicking past almost faster than the eye could catch them. whether or not this is a good or a bad thing depends on whether we consider time as a tyrant or as a friend. aside from the fact that it's going to kill you in the end, I think it's better thought of as a particularly annoying authority figure - something like a cross between Carol Vorderman and Simon Cowell - someone whose power over us we have no choice but to acknowledge, but whose actual presence is accepted on sufferance as a means to an end. that end, of course, being to cut through all this crap about dying to the chase about the sometime adventure, sometime burden of living - which manifests, simply, in different ways appropriate to the particular set of markers we've reached at the time. there's clearly a line - not an absolute line, something more akin to a floating border, a more or less wide, and fluctuating gradation - that distinguishes the values associated with conservatism and the defence of the status quo from those associated with the more radical politics of embracing change. it's a line that gets externalised in a number of ways that correspond to the degree of our personal engagement with the issues that emerge out of this - some would say - defining tension in any social organisation. nowhere is this line experienced more deeply than in the matter of ownership. the my-ness of what I perceive to be mine and the your-ness of what is yours - and our being able to agree on this - is fundamental to our ability to get along. essentially, there's nothing to distinguish the graffiti that cover every square inch of a New York subway carriage from the advertising posters that peep out from beneath it all. they're both - for the most part - superfluous to the original designer's intentions, they're both - for the most part - ugly and meaningless, and they're both - for the most part - conveying messages from opposite sides of that line that, really, none of us wants to hear. the advertisements are displayed in organised rows, paid for by the square metre; the graffiti is sprayed in random sweeps, and stolen. one set is safe - the silent icons of material consumption; the other is dangerous - the warcry of the gap-toothed dispossessed, the illiterate manifesto of the new barbarians at the gates. there's a foolish romanticisation of urban graffiti that extolls the substitution of one arbitrary set of aesthetic principals with another. whereas it's defensible to maintain that tagging the blank wall of a building or object that symbolises political and economic oppression in one form or another is a subversive action - a way of reclaiming something - it's clearly flying in the face of the mass of evidence to presume some kind of underground political movement linking the global authorship behind the graffiti we encounter on a daily basis. by far the greater part of it is no more considered than gobbing out your gum onto the pavement - at best, it's the human equivalent of a territorial animal's spraying his patch. every so often, a cat strays into our garden and has a sniff around. if it's unlucky enough to find itself impelled to raise its trembling tail and start squirting one of my bushes whilst I'm around, it will, more than likely, find itself the target of a well-aimed (I pride myself) missile - stone, clod of clay, half-brick - nothing lethal, but I do take great satisfaction in hearing the surprised howl and witnessing the undignified scuttle for the fence, and feel no remorse whatsoever for such summary disposition of what I consider to be justice: cat tries to spray my bush, cat receives painful lesson that will hopefully deter future sallies. the crucial pronouns are 'my' and 'our'. no-one's going to deny me the right to defend my own territory from invasion or defacement. the interesting dialogue begins when we extend the meaning of 'our' to stuff that, whereas not actually belonging to us, we nevertheless feel an attachment to as if it did. few tears are shed, for example, when a corporate HQ is defaced - except by the security guards who lose their jobs for failing to defend company property. most corporate architecture is indefensibly repellent - either that or, Richard Rogers style, jauntily monumental. with the notable exception of the Bauhaus, few schools of public art and design have taken the marriage of form and function to mean much more than maintaining the classical proportions in the toilet cubicles. architecture is one of those fringe art forms that rests solidly on a foundation of simple wealth. at least it doesn't pretend otherwise. any conversation that begins 'our architect suggested..' does not come with a secondhand camper van parked outside on the street, and so-called 'visionary architects' have a poor record of providing effective social housing. on the other hand, if anyone were to be discovered interfering in any way with the Diana memorial fountain in Green Park, they'd most likely be lynched. it can be of small wonder to anyone who has ever visited - or has the misfortune to have to inhabit - any of the architect-designed New Towns, or those clusters of high-rise accommodations that blight the outskirts of every city, that respect for their environment is low on its inhabitants' agenda. if, time and time again, the architects behind these mass social housing schemes get it so wrong (with one or two magnificent exceptions) as to drive their residents to the kinds of behaviours consistent with lab rats in a maze, who can possibly be surprised that, time and time again, the basic taboos against shitting in your own backyard get broken. once the fundamental constituents of what's been described as 'social capital' - ie citizenship, neighbourliness, trust and shared values, community involvement, volunteering, social networks and civic participation - have become so eroded as to have lost their structural integrity completely, nothing short of wholesale transportation or quarantine containment is going to prevent the leakage of the resultant socially degraded behaviour into society at large. mediaeval piles are riddled with graffiti. one of the indispensable items in the eighteenth- and nineteenth-century gentleman-traveller's travelling trunk was a stonemason's chisel and mallet, which he would employ to carve his initials into the stone wherever he could find a space to do so. no abbey, bridge, milestone, or monument - from Wells Cathedral to Stonehenge - was exempt from his tag. some of these initials are carved with remarkable skill - it would seem that the art of stone-engraving - at least the art of engraving a decent Gothic font, complete with serifs - was considered on a par with all the others at one time. such graffiti, however, are allocated a particular status in the public affection not so much for the skill of their execution - Banksy's work is more skillful - but for their historic association. a carving dated 1806 is automatically allocated a heritage rating that will never apply to a spray-painted 2006 simply on the basis of its age and its social provenance. a two-hundred-year-old defacement has acquired a patina no less valuable than if it were gold-leafed, not only because it's old, but because it was done, most likely, by a gentleman - a nobleman, even, with luck. 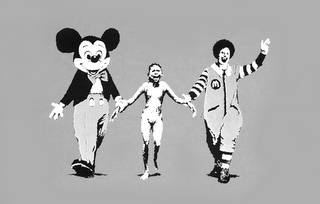 the automatic authority that formerly accrued to the ruling classes by dint of nothing more than tradition backed by overwhelming force has long since been passed on to the corporate vandals whose tags - they call them logos - stare down from every hoarding. nevertheless, the indiscriminate spraying of any blank surface just because it's blank isn't automatically to be applauded as an act of anarchic reclamation. for every graffiti artist whose stencilled works are replete with wit and wisdom there are a thousand amateurs whose daubs represent nothing more artful than the droolings of a dyspeptic hamster, and even though I might have had no say in the design and execution of most of the public stuff that I encounter on the street, I would prefer, for the most part, the unembellished blankness to the talentless tagging that usually stains it. forced to side, though, I'd have to choose the spray-canning vandals against the ones with the forces of so-called law and order on their side. but woe betide them if they come spraying in my back garden.